"Microlepidoptera" informally refers to small moths, about half of the Lepidoptera. The majority of "microleps" have larvae that feed inside or concealed within their host plant, rather than feeding openly on the surface. This fact makes microlepidoptera particularly important for plant inspection and control measures, because concealed larvae are harder to find and eliminate. In this tool, we focus on two specific groups: several genera of the tribe Gnorimoschemini (Gelechioidea: Gelechiidae) and the Leucinodes group of Spilomelinae (Pyraloidea: Crambidae). These groups represent the largest radiations of microleps that feed on Solanaceae, with a disproportionately great number of economically important species. The few other Solanaceae-specialist microleps in other families are not covered. These include a few species in Gracillariidae and Pyralidae (Phycitinae), none of which have been recorded from North America. With one exception, generalist herbivores also are not included. 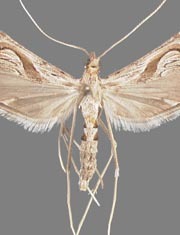 Larger moths, the "Macrolepidoptera," can be characterized by adaptations of the larva for feeding externally. Foremost is the possession of crochets on the prolegs in a mesoseries (fig. 1). This arrangement is adaptive for clinging to external foliage. In contrast, micros almost always have crochets in some other arrangement: in a circle, broken or not, or a transverse band, or absent entirely. 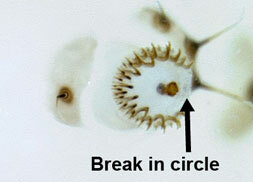 The microlep taxa treated here have a circle or broken circle (fig. 2). 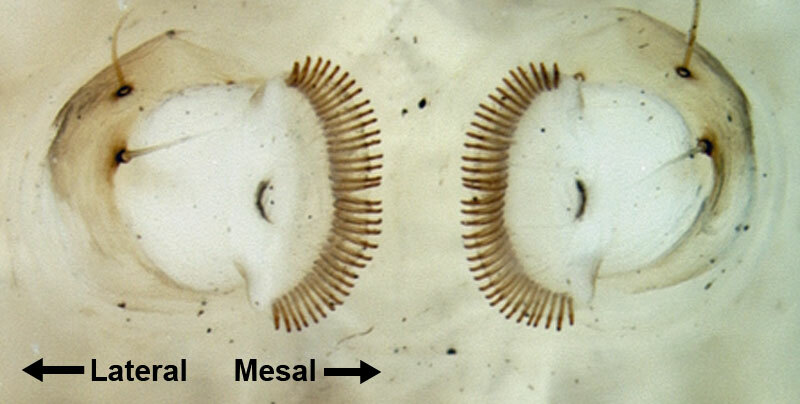 This pattern separates them from macroleps, including first instars, which due to their necessarily small size can be mistaken for older microlep larvae. The user is assumed to be sufficiently experienced to screen out non-Lepidoptera. 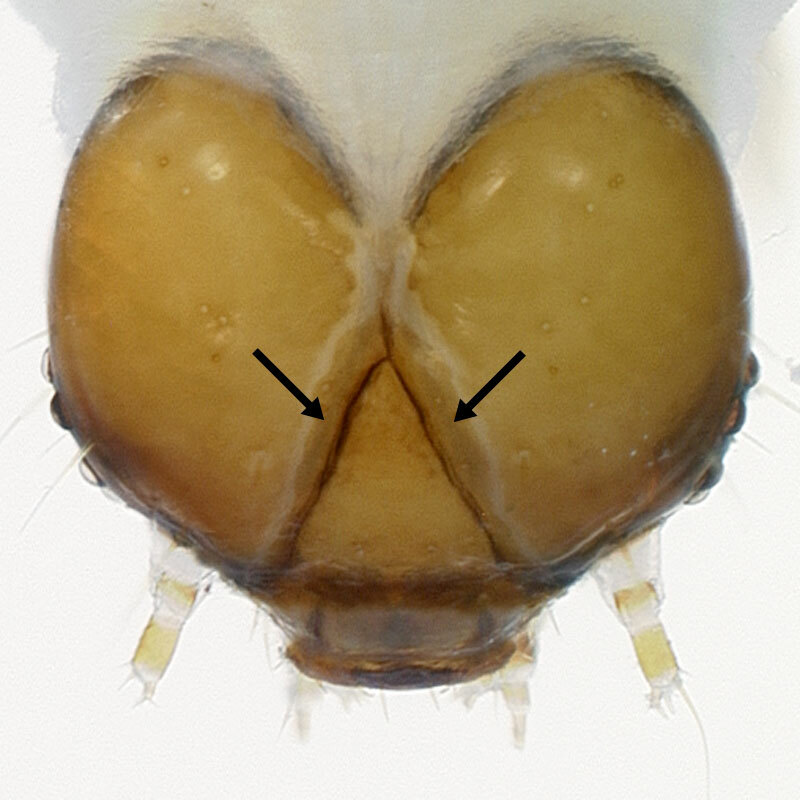 The possession of a well-developed head capsule with adfrontal areas (fig. 3) diagnoses lepidopteran larvae from Coleoptera and leaf-mining Diptera, such as Liriomyza, a very common pest of tomato foliage. 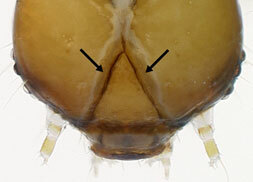 Other larval features include a "naked" appearance: only primary setae are present (the larva is not "hairy"), and the cuticle lacks significant projections or sculpturing visible at low magnification. The species treated here have five pairs of abdominal prolegs, the possession of which separates them from the few Gracillariidae that mine leaves of Solanaceae and have fewer than five pairs. The adults of the species have a forewing length less than 2 cm. 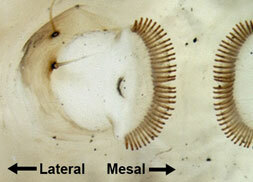 The taxa included here happen to belong to groups (Gelechioidea and Pyraloidea) that have scales along the basal area of the proboscis. This separates them not only from small-sized macroleps but almost all other micros that feed on the same plants. Nomenclature of moths follows Nuss et al. (2013) for Crambidae, Lee, Hodges and Brown (2009) for domestic Gelechiidae, and Lee and Brown (2010) for exotic Gelechiidae. Botanical nomenclature follows USDA, NRCS (2013) for domestically established plant species and The Plant List (2010) for exotic species.